Android tablets are multimedia consumptive devices that are perfect for various occasions, but when it comes to productivity, they’re still usable to an extent – albeit, not as good as their Windows counterparts. Very recently, we reviewed the 10.1-inch Android version of the Lenovo Yoga Tablet 2, which offered a lot of value for its price of $300. 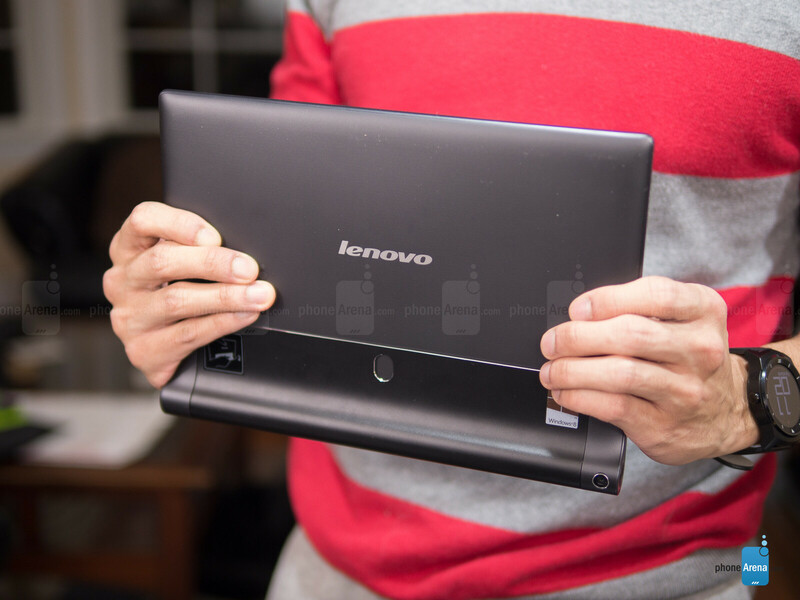 However, for those who crave a higher level of productivity, Lenovo has a Windows version of the same tablet that may prove to be an even more alluring option. It’s the same unorthodox design from before, with the exception of a gunmetal paint job. There’s nothing different with the design of this Windows powered tablet, seeing that it employs the same unorthodox design language of its Android counterpart. Generally speaking, in terms of tablet designs, it’s still pretty different from the usual slew of slates we find – thanks in part to its cylindrical hinge, which not only offers us a natural and ergonomic way of holding it, but also houses a uniquely engineered 9600 mAh battery as well. Interestingly, there are two minor cosmetic differences with this one, with the first being the Start button beneath the display, and the other being its gunmetal paint job. Besides that, everything is identical from before. 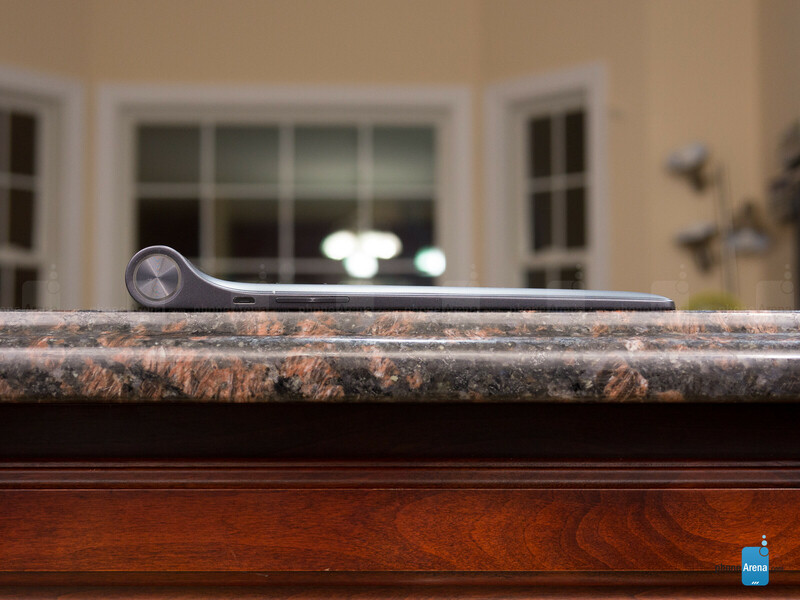 The cylindrical hinge is also home to the tablet’s adjustable kickstand, which offers us multiple positions. From its stand mode for easy typing, to hold mode for a hands-free watching experience, and to its newest 'hang' mode, it goes to show that it has the yoga moves for all occasions. Looking around, it features a power button, volume controls, microUSB port for charging, 3.5mm headset jack, microphone, microHDMI port, front-firing speakers with Wolfson Master HiFi audio processing, and microSD card slot. 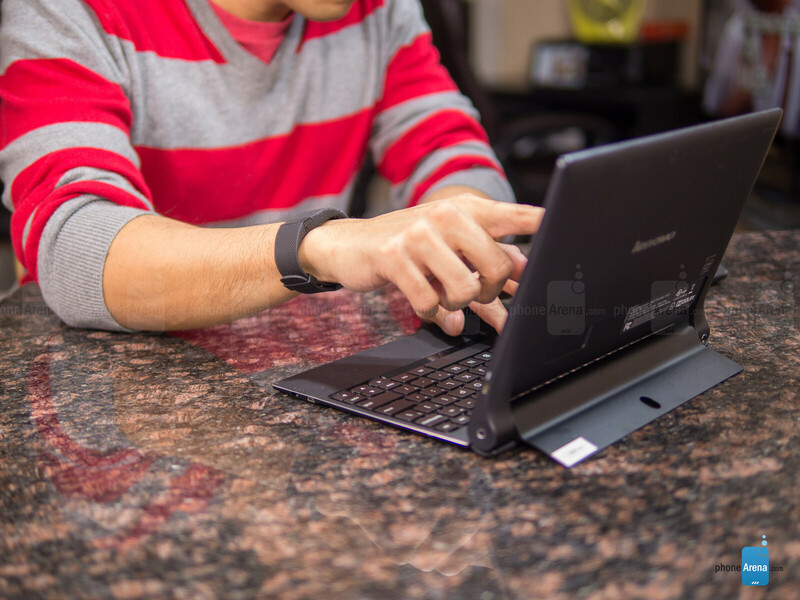 Included with the tablet is a Bluetooth AccuType Keyboard that’s attached magnetically to the cylindrical hinge. This addition, of course, offers us with a better experience thanks to its chicklet styled keys, full QWERTY layout, and trackpad. Thankfully, the adjustment period is short, seeing that its responsiveness and manageable layout allows us to type at a good pace – and without too much fault! This 1920 x 1200 IPS display delivers satisfying results across the board. 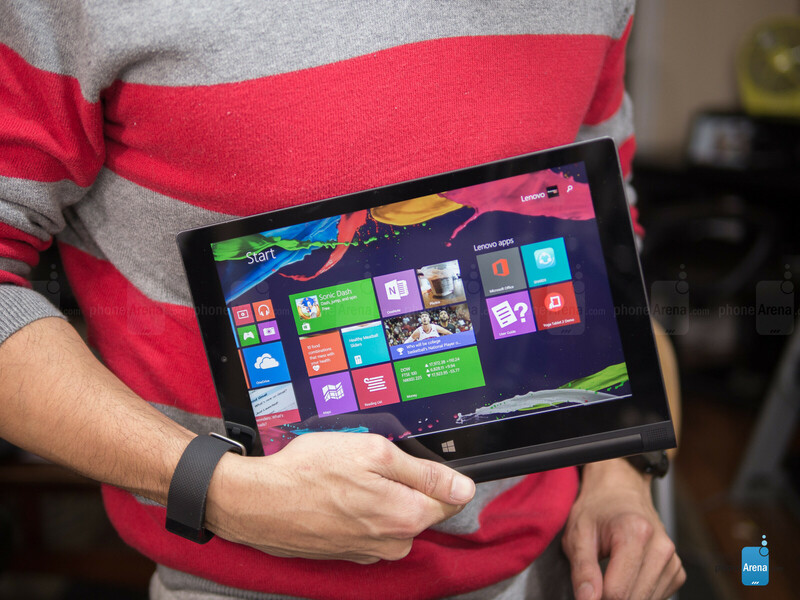 Specs-wise, it’s the same as its Android counterpart, so it’s packing along a 10.1-inch 1920 x 1200 IPS LCD display. Naturally, the resolution delivers sharp details, giving it a respectable pixel density count of 224 ppi. That’s more than generous to make text in the web browser remain easily readable to the eye. The screen bears a number of other respectable characteristics, such as a 7200K color temperature and good viewing angles. When it comes to color accuracy, reds happen to lack intensity somewhat, in comparison to green and blue. The panel’s maximum brightness hovers around the 346 nit point, which is behind the 404 nit figure of its Android counterpart. Despite that, we’ll say again that the screen is pretty attractive. damn sleek design. love it lenovo! John V. couldn't do a proper, unbiased review if his hair was on fire. The constant mentions or comparisons to Android are getting really old. This is a full-blown, x86-based COMPUTER!! It's not a tablet for watching Netflix or playing Candy Crush. Did you really even read the article or just complain? The exact same machine is made with android and that is something worth mentioning. This review would be completely worthless to me and many others without mention of its android counterpart. I recently purchased the android version for someone and did a lot of research trying to figure out if the Windows or android version would be better suited for their needs. Where this particular review lacks though, is that comparisons to the popular Asus Transformer and Acer switches should be included. Of course I read the article, I'm thinking about one of these. The review is for a Windows computer, not an Android tablet. They're two totally different animals and it makes zero sense to compare this to ANY tablet or ARM-based device. I agree with your last sentence and it bears out my argument. 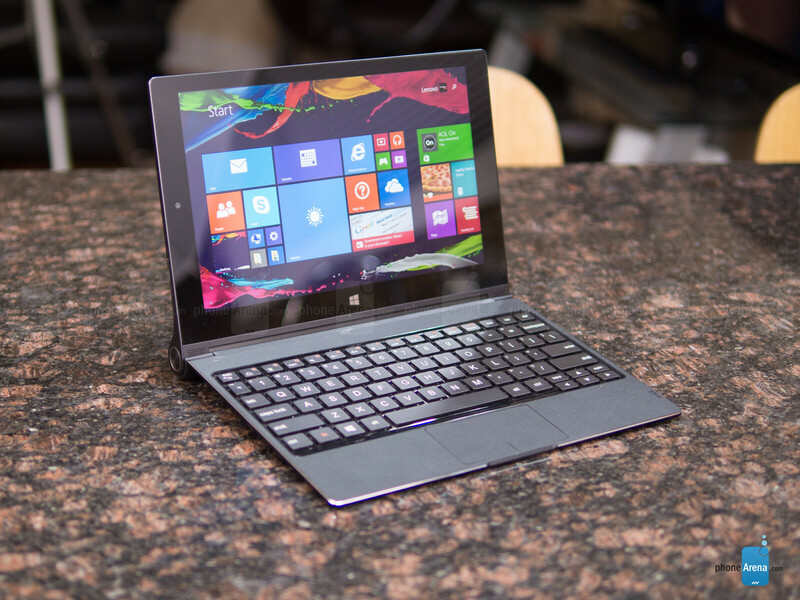 Instead of comparing to an Android, the comparisons should have been the Switch or the HP Pavilion X2. I agree with Crispin_Gatieza. The reviewer isn't only drawing comparison to the Yoga Android counterpart, he's drawing comparison to other Android tablets too - to be honest, what the point in that? You're either interested in buying the Yoga 2 and cant decide on the Android or Windows version, or you're after a Windows tablet and can't decide which make to buy. I couldn't care less how the Kindle Fire HD or Nexus performs, I'm not buying an Android tablet, which is why I'm reading a review on a Windows tablet. As a potential purchaser, I'm far more interested to see how this model compares with the Switch, Transformer, or HP Pavilion. I think this is a massive oversight on the part of the reviewer. You do know the exact same processor is used in the android version of this lenovo tablet as is in the Windows version? Not only that, but as an accessory, the exact same keyboard is also available that's included with the Windows version. I think it's pretty fair to include android comparisons for those reasons. The end user needs to know if it's worth paying $100 more for this Windows based hybrid over the android one. You do know you can't connect any peripherals to the Android, right? You do know you can't run legacy Windows programs on the Android, right? You do know you can't run a full desktop browser on the Android, right? There is no comparison. Take the Android offline and what can you do with it? Very little. If you don't know the difference between a real computer and a tablet, I can't help you. Please spend some time studying and learning the devices. I think there is a lot you may be unaware of. There are plenty of peripherals that can be connected both online and off. Are you familiar with USB-otg? You know you can connect usb drives, dvd drives etc with that. Obviously the support may not be as extensive as Windows but it is there none the less. You can also connect to various peripherals with Bluetooth and Wi-Fi. Android works wonderfully offline, give it a try. I've written and worked on plenty of office documents offline on my phone alone, although it is much harder to do so then with one of these tablets/hybrids due to the small screen. You also need to take a little time to understand who these devices are aimed at and who are the masses. 3/4 of the people out there won't know the difference or even care about a full desktop browser. In fact I find it extremely rare myself to be unable to do something in a browser on an android device that I can with my pc. I'm currently writing from a browser in android with 41 tabs open. At least have the wherewithal to know the difference between a peripheral and an external drive/storage. USB on-the-go does NOT provide power to a peripheral. Devices must be self-powered or have an external power source. If a device requires drivers, Android is out. If a program contains an executable, Android (all ARM-based devices for that matter) is out. Your argument would be ok if it were a Windows RT device like the Surface 2 or the Nokia 2520. Windows computers are compared to Apple OSX computers, not iPads. Android does not have anything to offer in the desktop space and youngsters really think that mobile computing will supplant desktops. In your wildest, wettest dreams. If for no other reason, design and manufacturing. Thus endeth the lesson, class dismissed. I'm sorry. You just don't appear to understand the market and don't understand where it is and where it's going. You don't seem to have much experience with devices and seem to be stuck in the old way of thinking which is what got Microsoft into big trouble. The computing world is changing a lot. Hopefully with a few more years experience you'll have an idea and have a better understanding. I'm almost knocking on AARP's door. How much more experience do I need. I've been using cell phones and computers for over 20 years and have owned devices from every OS ever released. What's your excuse besides arrogance. I have seen every trend and every fad come and go but there's one irrefutable fact: desktop will never be replaced by mobile computing. It simply doesn't have the horsepower to do graphic-intensive work. You can have 50 tabs open on your Android browser but I defy you to open just one CAD file with all layers turned on. Then just for kicks, try editing an X-Ref and see what happens. Nothing, that's what. AutoCAD 360 is barely a viewer much less an editor. Revit on Android is a joke. By the way, it's no better on iOS or Windows 8.1 RT. When you figure out there's a world out there with real industries doing real work, call me. You still don't get it. AutoCAD and Revit? Are you remotely even serious? Now you're talking again about highly specialized software. Let's revisit a quote from above. "You also need to take a little time to understand who these devices are aimed at and who are the masses. 3/4 of the people out there won't know the difference or even care about a full desktop browser." Let's replace 3/4 with 90%+ now if you're going to mention the particular software that you have. On top of that to quote you "I have seen every trend and every fad come and go but there's one irrefutable fact: desktop will never be replaced by mobile computing. It simply doesn't have the horsepower to do graphic-intensive work." That quote, by you, says you are completely stuck. Please, please, please read up some more on industry trends. Are you familiar with convergence? Furthermore, why don't you research NASA and what they've managed to accomplish with android? To suggest that mobile computing will never have the horsepower to do graphic intensive work is to not have paid attention to everything that's happened in the mobile computing world over the last 3+ years going from single, to double, then quadruple core+ processing power now with 64 bit architecture. The mobile processing world has rapidly been gaining on the desktop and will soon be able to handle the highly specialized software you mention. To reiterate, the average consumer doesn't care about autocad, revit or desktop browsing mode. They care about being able to get online, browse the internet, pay bills, listen to music, watch a video, and perhaps light document work. Both the android and Windows tablets are perfectly suitable for that use. Furthermore, neither the Windows or android tablets and hybrids mentioned here would likely be used in satisfying experience to run highly specialized graphic intensive software. 2 GB of ram is just too little, and you'd likely want something more powerful than an Intel z series processor. Have you ever run any of these programs or do the fancy titles scare you? "To reiterate, the average consumer doesn't care about autocad, revit or desktop browsing mode. They care about being able to get online, browse the internet, pay bills, listen to music, watch a video, and perhaps light document work." You don't need an x86-based device for the items you just described. Any ARM tablet will suffice for those purposes. Those who want to do more choose a hybrid like this Yoga because it IS capable of running x86 software. Get it through your thick skull that this Lenovo is capable of more than any ARM tablet in existence and therefore the comparisons are not justified. A Dually Diesel F-350 will get you to work everday, but I'd rather drive the Fusion and save gas and insurance. Now if I need to take my 29' Sea Ray 290 Sundancer out, the Fusion ain't gonna cut it. Yeahi agree, they are many laptop for different type of use and lenovo is one of the best offering value for money products in general.